NextByzantium and Europe: Croatia, between a rock and a hard place. The male peacock is a large pheasant (peafowl), usually blue or green and originally native to India. He is known for often being a big show off with his plumage and iridescent tail. Seasonally, he hopes that his long shimmering train will win over a female mate. People have been witness to this courtship dance for thousands of years. The ancients, in turn, fell in love with the peacock and worshipped it almost like a god. In its native home of India, peacocks played a part in various myths. Interestingly, for thousands of years it is said that the peacock graced Indian palaces and temples fighting off evil snakes. Further east in China, the peacock was considered a good omen that was able to ward off evil spirits. 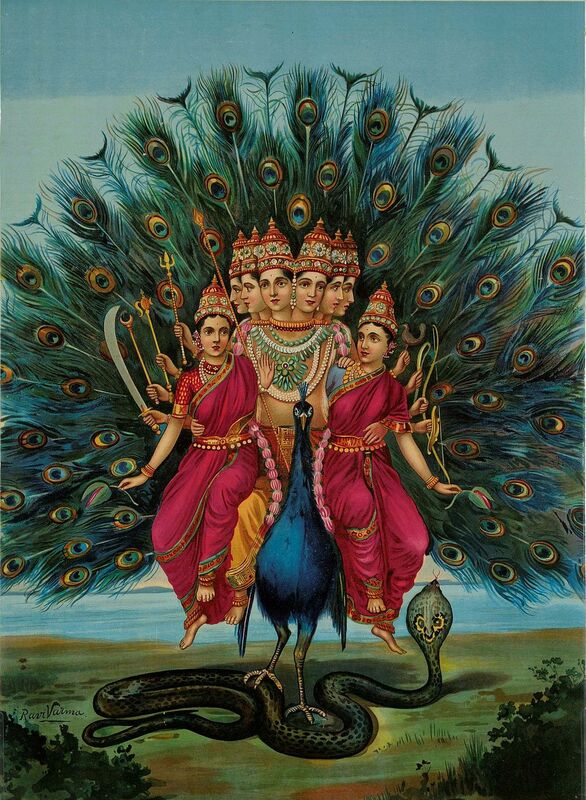 In Hindu mythology the peacock was worshipped as a symbol of the sun. The peacock also served as a mounted vehicle to many of the Hindu’s war gods including Brahma and Kama, and Kartikeya (below). When Alexander the Great conquered northwest India he came face to face with this sacred bird. It is believed that he took the peacock back with him during his return journey. Though this story contradicts some other sources that have the peacock in Greece by the fifth century well before Alexander through Babylon and Persia. Interestingly, Aristotle once referred to the peacock as a Persian bird, giving us reason to believe that the peacock came via Persian routes. Some scholars believe the ancient Greek settlement on the Island of Samos was the first place the peacock was revered and in time dedicated to the Greek goddess Hera, the wife of Zeus. In Greek mythology, Hera created the Peacock from her trusted watchman, the hundred-eyed giant Argus. When Argus was killed by Hermes at Zeus request, Hera mourned his death and placed his eyes on the tail of a peacock, as a lasting tribute of her gratitude for his loyalty and service. 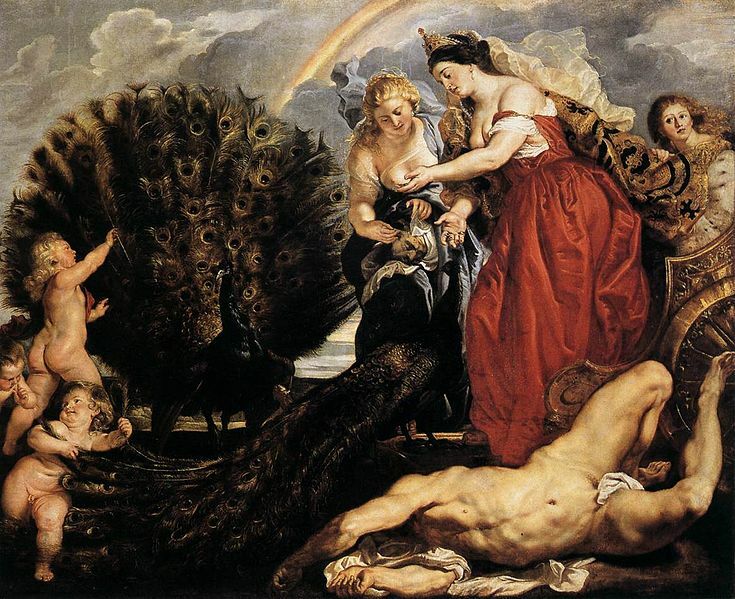 In Peter Paul Ruben’s depiction of ‘Juno and Argus’ circa 1611, Juno (Hera) is removing the eyes of the decapitated Argus and setting them into the tail of her peacocks. The peacock has also been subject of other various myths and legends including those of religious significance. In Christian mythology, it is believed that the peacock, who declined to eat the forbidden fruit in the Garden of Eden, was rewarded for its abstinence, whereby its flesh would never decay after death. 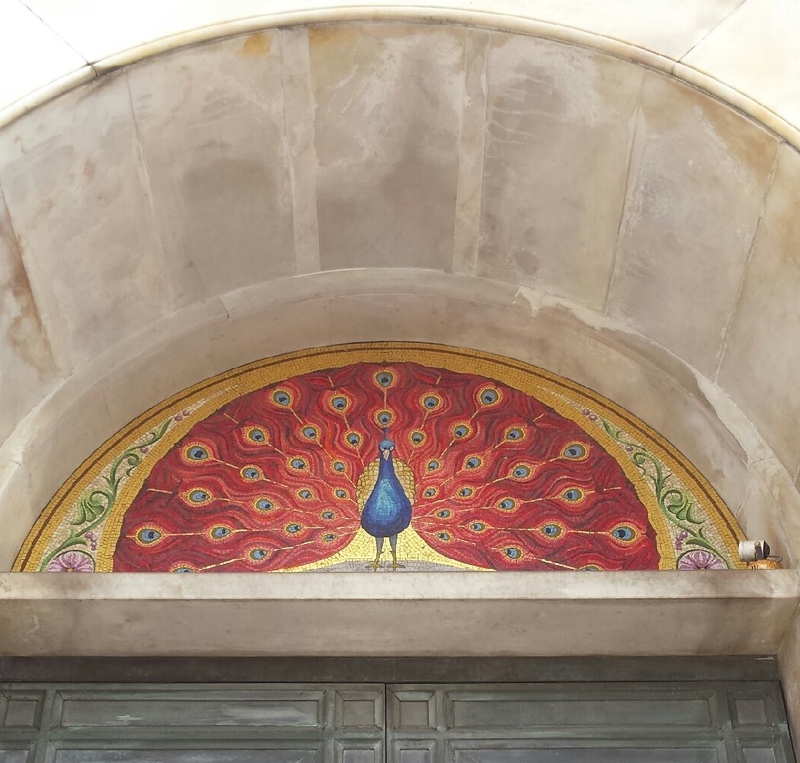 It is through Christian and Byzantine art, that the peacock then became associated as a symbol of resurrection and paradise. Naturally though, the peacock is also known to shed and replaces his feathers every year, and as such, added to the legend of the peacock as a symbol of rebirth or renewal for Christ. There are also other interesting legends associated with the peacock about its tail feathers, its ghastly voice and even its feet. According to a popular Islamic tale, the peacock got its ghastly voice after it fell from grace and was cast out of Paradise. The tale describes how the peacock was seduced by Satan, with the promise to teach the peacock, three important words to save him from ill-health, old age and death. Satan would only teach the peacock these three words if only he was let to pass through the gates of Paradise. Truly mesmerised by the possibility of immortality, the peacock agreed to help Satan and schemed with the aid of the serpent to let Satan enter Paradise. When Satan later seduced Eve, God became angry and cast out of Paradise Satan, the serpent and the peacock. For added measure God took away from the peacock his beautiful voice. It is well documented that apart from adorning the walls and floors of mosaics in churches, medieval Christian manuscripts were often decorated with beautiful illustration of varies birds including peacocks with meticulous detail. Some were accurately drawn, but most were generally stylized for effective. The peacock was also once prominent in painstakingly produced art. For example, during the 17th century Golden Age of Dutch and Flemish painting, the peacock was often depicted in rural settings and gardens. 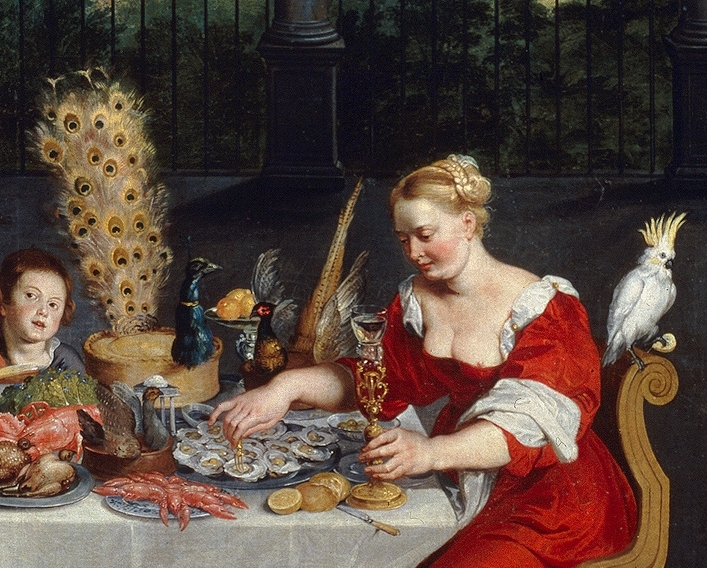 Jan Bruegel the Elder even painted a peacock being served in full plumage (above), in 1618. Peacocks were also portrayed on decorative pieces such as pottery and ceramic plates. They are only a handful of examples of magnificent Ottoman dishes from Iznik that illustrate the handsome qualities of the peacock. These plates were produced in western Anatolia (in Iznik) between the 15th and 17th centuries. It is often commented on how surprisingly rare images of peacocks are on Ottoman pottery, considering their association with Ottoman royalty. But perhaps, the peacock is arguably best viewed as a quintessential symbol of royalty and wealth. A magnificent jewelled peacock throne was thought to have once existed in Northern India during the early part of the seventeenth century, as the greatest example of the peacocks power and status. (It was apparently later plundered in the eighteenth century, as part of a substantial war booty by a Persian king, but subsequently lost forever.) In other examples of its symbol of royalty and wealth, the peacock is often found on the reserve side of Roman coins that feature the Empress. Its feathers were also personal adornments of men’s helmets and other heraldic devices. Even Marie Antoinette was known to wear ostrich and peacock plumes in her hair. During the Byzantine era, peacocks occasionally decorated the gardens of wealthy Byzantines where they allowed them to roam freely as living exhibits on estates. Finally, although not in the spirit of veneration, wealthy Romans particular liked the peacock as one of their favourite delicacies. I’m not sure whether people today, unlike our Roman friends, would still see this beautiful bird as a culinary delicacy? He is protected by law in many countries today, including in its native habitat of India. In fact, many Indian communities today still regard the peacock as a sacred bird. It is no wonder it became India’s official national bird in 1963. When all is said and done, it’s not difficult to see why the peacock has been fussed over as a sacred and revered bird throughout history. Those wonderful feather have always been its best feature, particular when he extends and fans its long train of feathers in the throes of courtship. 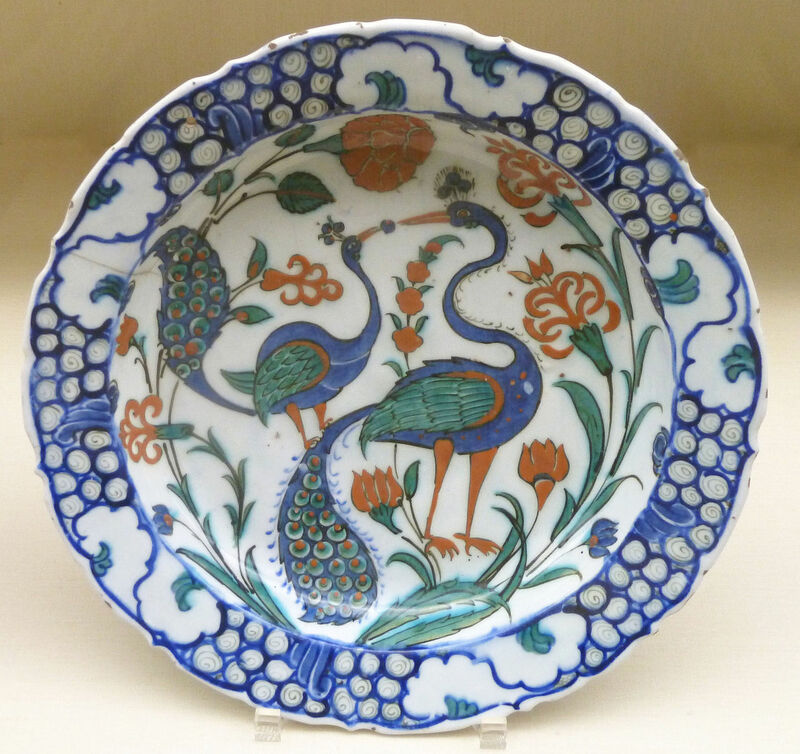 Photo Credit: The header image and the Iznik, Ottoman dish with peacocks and flowers are both used under the Creative Commons Attribution Share-Alike 3.0 license. All other image are public domain. The image of the fanned peacock on the front of a local Catholic Church in Melbourne and the peacock walking along a grass field were photographed by Robert Horvat. Fascinating history about the peacock. I was unfamiliar with the myth of Juno removing the eyes of Argos and using them for the peacock tail. Quite a brutal image to go along with the story too. In 1611, painted images were quite powerful. It makes you wonder what information those who viewed this painting took from it. I guess we’ll never know.